Who said you had to be a pilot and know how to fly a plane to own your very own IAF flight jacket? This IAF flight jacket is fashionable, trendy and made just for you. This coat will keep you warm with great look. There are two pockets, one on either side of the coat. These two pockets have a snap that will keep them closed keeping your personal items safe inside. There are also two additional pockets for additional places to store your items. The exterior pocket is located on the sleeve and has a zipper to keep it closed. There is another pocket on the inside of the flight jacket lining, this secret pocket will allow you some privacy for your personal items that you want to keep closer to you. 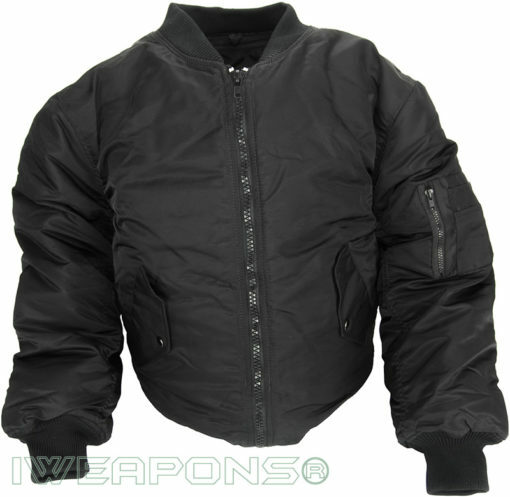 This IAF flight jacket has cuffs on the sleeve that are made from elastic fabric. This elastic wraps around your wrist for added warmth on those cold days and frigid nights. The snug sleeves will prevent the cold air from traveling up your sleeve making you cold. The elastic sleeve of this coat will make sure you stay nice and comfy warm. Whether you are traveling through the cold terrain or simply trying to stay warm on those cold weather outings this IAF flight jacket is just what you need. There is also another bonus for the IAF flight jacket which is that it comes in two awesome colors, you can buy this amazing coat in blue or black. You can buy this super stylish, 4 pocketed, elastic banded sleeve warm. Stay warm and in fashion.